Boxer Joe Pendleton, flying to his next fight, crashes ... because a Heavenly Messenger, new on the job, snatched Joe's spirit prematurely from his body. Before the matter can be rectified, Joe's body is cremated; so the celestial Mr. Jordan grants him the use of the body of wealthy Bruce Farnsworth, who's just been murdered by his wife. Joe tries to remake Farnsworth's unworthy life in his own clean-cut image, but then falls in love; and what about that murderous wife? As a kid, I really liked Warren Beatty�s Heaven Can Wait from. As an adult, I saw � but didn�t enjoy � Chris Rock�s Down to Earth from 2001. Both flicks were based on 1941�s Here Comes Mr. Jordan, so with that movie�s DVD debut, I figured it was finally time to check out the effort that inspired the other two. Boxer Joe Pendleton (Robert Montgomery) is on the verge of a bout with KO Murdock that will allow the winner to subsequently fight for the championship. However, as the amateur aviator flies himself to New York, he hits a snag: a malfunction causes his plane to crash. Now deceased, Joe meets Mr. Jordan (Claude Rains), the boss in charge of Heavenly departures. Joe claims that he shouldn�t be there, and it turns out he�s right. He was taken by his �messenger� (Edward Everett Horton) before he actually crashed, so he needs to head back to Earth. Mr. Jordan authorizes this, but it�s too late: Joe�s manager Max Corkle (James Gleason) already had him cremated. This creates an awkward situation but Mr. Jordan comes up with a solution. He�ll place Joe in the soon-to-be-deceased body of his choice. Joe eventually settles on the almost corpse of wealthy Bruce Farnsworth. His wife Julia (Rita Johnson) and her lover Tony Abbott (John Emery) drown Farnsworth, and Joe wants nothing to do with this sordid situation. However, when Joe meets Bette Logan (Evelyn Keyes), a babe whose father Farnsworth cheated, our boxer falls for her and decides to become a new man to help, though he only agrees to be Farnsworth long enough to assist Betty. Mr. Jordan slips Joe into the body before anyone notices the demise. As Farnsworth, Joe cleans up some ethical messes and does right by Bette. This complicates matters since Mr. Jordan finds an athletic new body for Joe so he can continue to fight. However, Joe goes with his heart first and decides to stay as Farnsworth to woo Bette. In an attempt to have his cake and eat it too, Joe tries to turn Farnsworth into a fighter. The movie follows these various plot threads along with additional complications. As I mentioned at the start, Jordan stands as my third experience with the story, so I didn�t think I�d find anything unexpected in the tale. Though that remained true, the movie�s execution proves so fresh and delightful that nothing else matters. Much of the credit goes to Montgomery�s terrific performance as Joe. In the early moments, he proves amusingly combative and pushy as he works with Mr. Jordan and the messenger. Montgomery maintains that slightly insolent tone through the movie but manages to let the character grow and become more human. He�s valuable for comedic moments but also quite good as the more emotional moments. Montgomery isn�t alone, as the rest of the cast chips in plenty of fine moments. 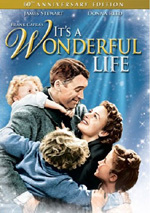 Horton provides a prissy little turn that makes his scenes valuable, and Gleason adds life to Joe�s confidante. Rains is always solid, and he allows Mr. Jordan to manage events with a serene confidence. The various actors bolster the flick well. At a brisk 94 minutes, Mr. Jordan also knows better than to overstay its welcome. With an inherently goofy plot, the flick could have exposed various holes and become tedious with a longer running time. However, since the movie cranks along the way it does, it keeps us entertained and involved. The balance of comedy, drama and romance also moves the action nicely. Really, there�s little about which I can complain on display here. Here Comes Mr. Jordan tells an inventive tale that holds up even for those of us who�ve seen its remakes. The flick charms and amuses. Here Comes Mr. Jordan appears in an aspect ratio of 1.33:1 on this single-sided, single-layered DVD; due to those dimensions, the image has not been enhanced for 16X9 televisions. Despite some minor issues, the transfer of Jordan usually fared well. Sharpness was fairly positive. At times the movie came across as a bit soft and ill-defined, but not with great frequency. The majority of the flick seemed accurate and concise. No problems with jagged edges or moir� effects materialized, and only a little edge enhancement occurred. Given the movie�s age, I anticipated some source flaws. While some appeared, these stayed pretty minor for an older flick. The image looked a little too grainy on occasion, and I noticed a few examples of specks and marks. These were pretty modest, though, and not too intrusive. Blacks were deep and firm, while shadows came across as clear and smooth. Overall, this was a very satisfying transfer. I also felt pleased with the monaural soundtrack of Here Comes Mr. Jordan. Speech came across as slightly tinny but the lines were acceptably natural, and they seemed crisp and without edginess. Music was restricted to a degree, as I expected given the vintage of the track. Nonetheless, the score was clear and reasonably tight. Effects fell into the same category. Those elements were acceptably accurate, though they also lacked much dimensionality. Only minor background noise ever appeared. For a flick from 1941, this was a good track. Not a single extra comes with Jordan. No commentary, no trailer, no nothing! Heck, the DVD even comes with an exceedingly generic main menu screen; there�s nothing that identifies the movie there. For a DVD with a list price of almost $20, Sony could have put some effort into the package. At least the movie itself entertains. 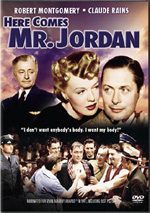 Here Comes Mr. Jordan provides a spry and amusing fable that holds up well after more than 65 years and various remakes. The DVD offers perfectly solid picture and audio but omits extras. This isn�t a stellar release, but I like the film quite a lot.